We are proud to have developed the ABC Cloud Based Accounting system to substantially reduce costs and time for small business owners. The way that our customers are handling their business accounts has changed forever by deploying the secure cloud based system – ABC. Cloud computing is a new form of internet based computing that shares online resources, data and information and allows instant access anywhere in the world, at any time, on demand. You use computer programs, expertise, resource that are remote from your office. So What is the ABC System for Business Accounts? 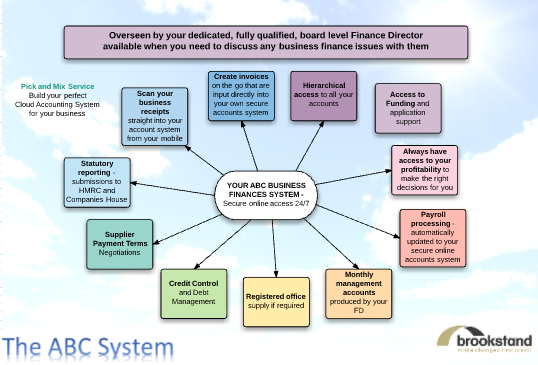 This brand new system combines every element of business finance in the cloud – and you only have to access the tools that you need. Some of the options are listed overleaf. You build your system, for the support that you need, and then we agree a monthly sum for all of the support accessible from your own secure online portal. Our packages start from only £100 plus VAT and all of our customers have reported substantial cost savings from every one of our packages. Is it difficult to transfer over from traditional accounting practices? No it is really simple. We will agree a day for transfer and we will agree the data that is taken from your existing records and put these as our starting point for your ABC account. All of this is overseen by your own dedicated Financial Director to ensure compliance at all times. What will it cost me per month? Every business requirement is different but you benefit from shared resources combined with the latest cloud technology. This substantially reduces your costs but you will still receive personal service and be able to talk to you account manager whenever you need to. We are real people at the other end – we just engage with you using the latest secure systems available. How secure are my company details? All of your details are stored and encrypted using the latest HTTPS connections ensuring that you data cannot be accessed by anyone but yourself and any individual that you authorise. We partner with the world’s most secure and advanced encryption and data protection servers.